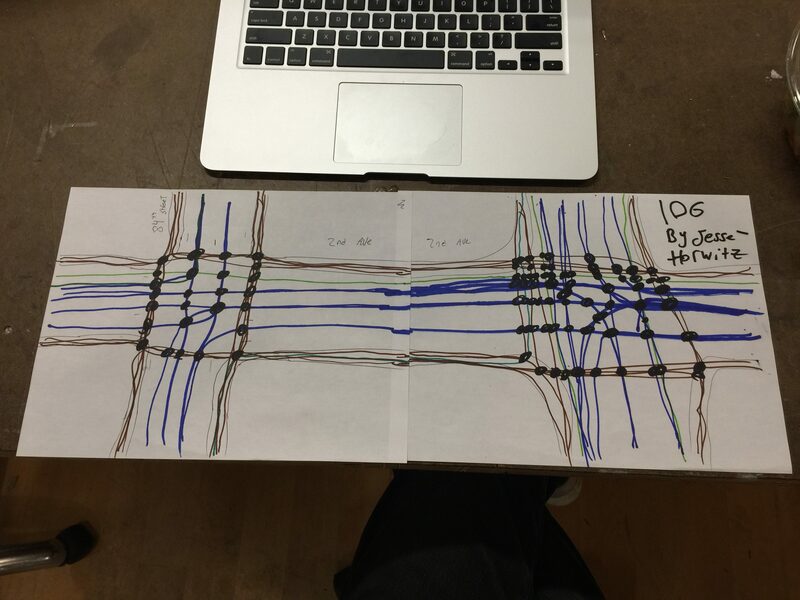 This week I created a set of instructions for a drawing and sent it to three friends. 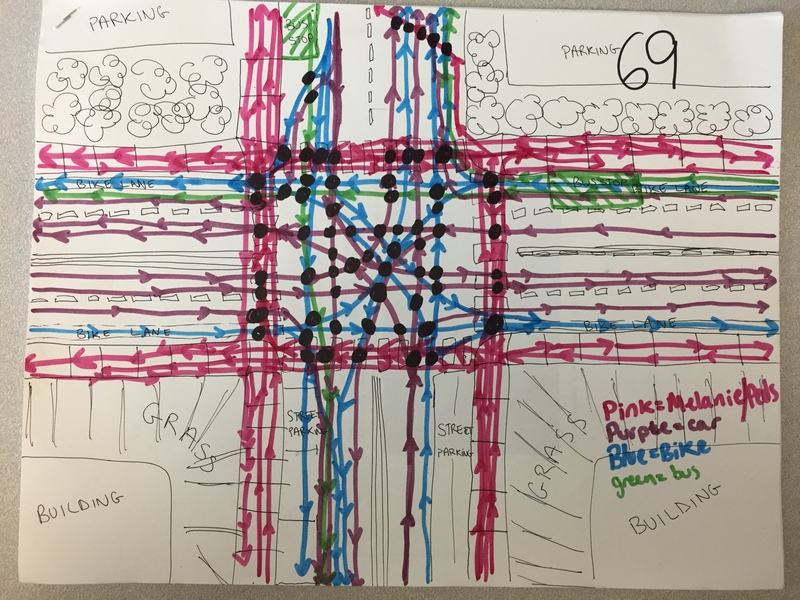 The goal of this activity was to produce a meaningful representation of the conflict points in our transportation system. Ultimately the person following these instructions ends up with an original aethstetic work as well as a functional way of quantifying the failure points of a local system. Grab a sheet of paper, a pencil and a few colors to draw with. Think of a route you know well; maybe this is your commute, or the way to a friend’s house. Think of the busiest intersection you passthrough on your way, particularly one that involves multiple modes of transportation ( i.e. cars and buses or pedestrians and bikes, etc.). 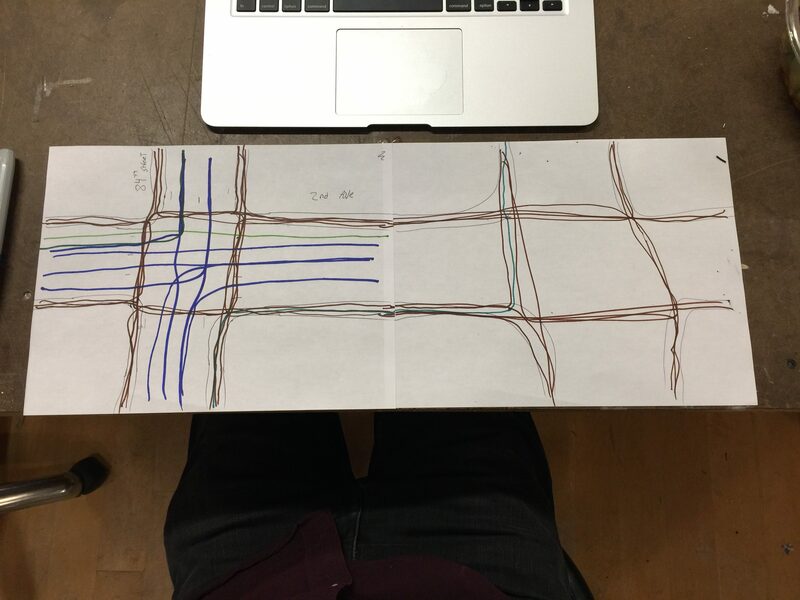 Using a pencil draw a rough top down view of this intersection with each right of way, route, road, or path extending to the edge of the page. 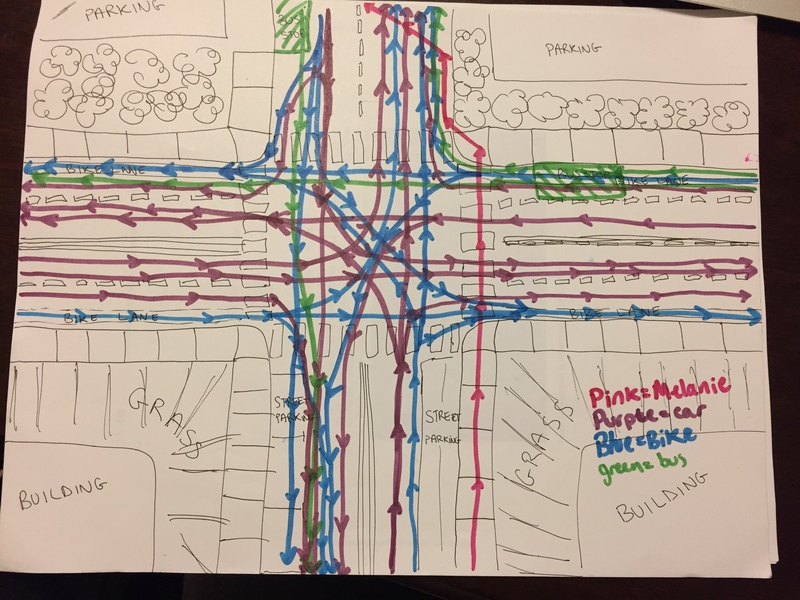 Include things like sidewalks and multiple lanes of traffic and make sure to label each of these corridors in the empty spaces where buildings, fields or parking lots might be. 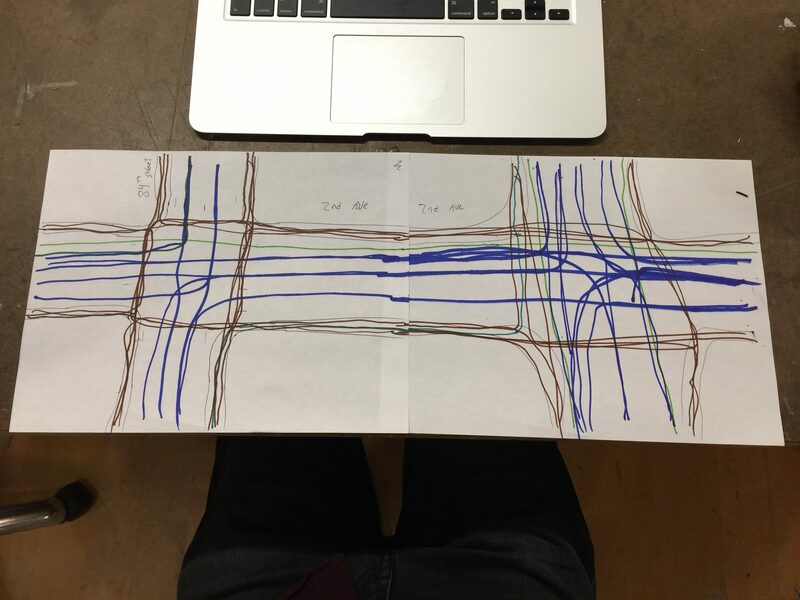 Using a unique color draw your typical path through this intersection from one edge of the page to another. 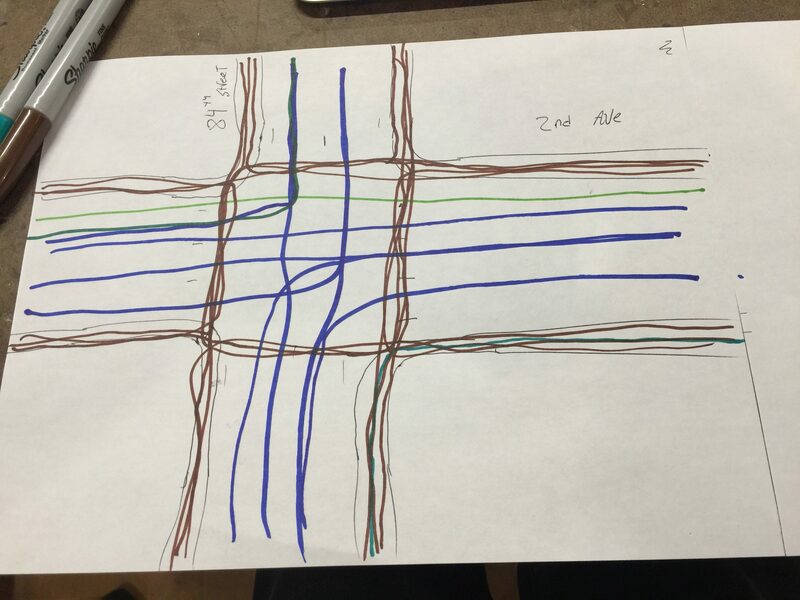 Using a different color for each mode draw all of the possible paths through the intersection from edge to edge. Draw a new line for each distinct path (its ok if they overlap a little). (Optional) Continue your route on another page. 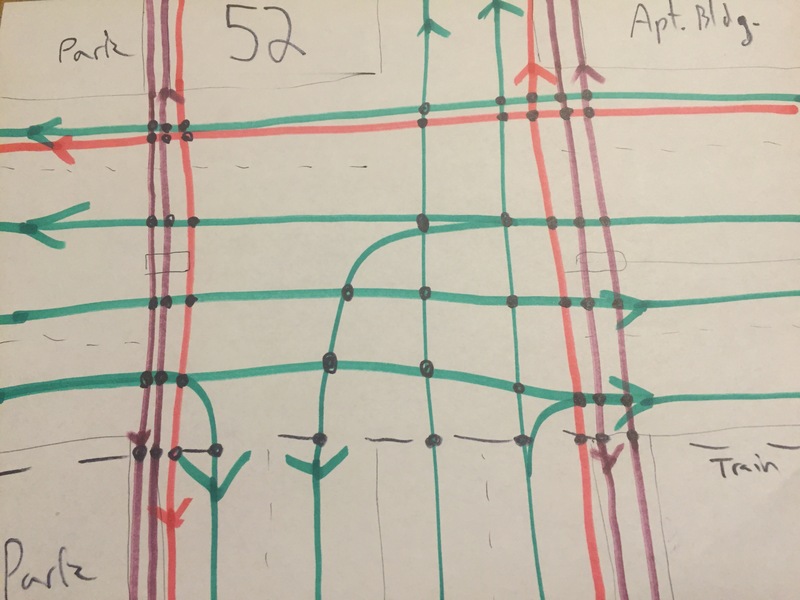 Using a new sheet of paper repeat this process for the next or previous intersection you passthrough on your route. Try to maintain the same color scheme and scale as your original drawing but continue from memory. Erase the pencil and draw a black dot over any points where two or more lines cross. There may be a lot of these. When you feel that you’ve finished, count each black dot and title your work with the total. I wanted to do something like this because of a frustration I have with our current infrastructure/transportation paragdime. In my opinion our transportation system mainly relies on intimidation and harassment to achieve a semblance of efficiency. I often think about how this could be re-engineered but given the scale and scope of this problem the better response may be to encourage others to think with me. That was the goal of these instructions. I hope you had a chance to look more into Denis Wood.